Pliny. Pliny was the governor of the Bithynia and Pontus. According to The Dictionary of the Christian Church he was born c. 61 and died c. 112. 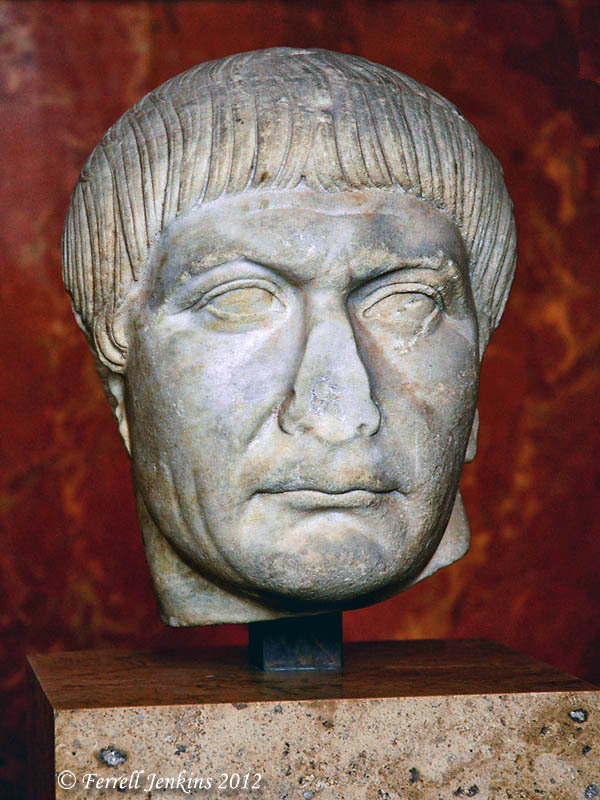 He exchanged a series of letters with the Roman Emperor Trajan (98-117 A.D.). I have done some browsing in the older Loeb edition (revised by Hutchinson) of Pliny Letters. I see references to the Black Sea cities of Heraclea (now Eregli), Amastris (now Amastra), Sinope (now Sinop), and Amisus (now Samsun). I mention this to emphasize that Pliny was familiar with the cities of Pontus. He writes of Sinope being ill supplied with water and suggests a solution to the Emperor. Roman Emperor Trajan in the Louvre. Photo by Ferrell Jenkins. In the meanwhile, the method I have observed towards those who have been denounced to me as Christians is this: I interrogated them whether they were Christians; if they confessed it I repeated the question twice again, adding the threat of capital punishment; if they still persevered, I ordered them to be executed. (X.xcvi). The Christians were ordered to offer wine and incense to the image of the Emperor. Pliny had been told that those who are really Christians would not make such an offering. Some of those who were questioned said they had quit serving Christ as much as 25 years earlier. Think about that date (about 85 A.D.). This gets us close to the date of Peter’s epistles (1 Peter 1:1). He said that no search should be made for the Christians. If a Christian repented and demonstrated his repentance by “adoring the Gods” [offering the wine and incense to the image of the Emperor] they should be pardoned. I think this is the type of worship mentioned in the book of Revelation which was written a few years earlier to the churches of the Roman province of Asia (Revelation 13; 14:9-11). Phil Harland comments on the charges brought against the Christians. For more along this same line see Phil Harland’s post about Bithynia and Pontus here. My intention is to turn next to the specific question of the route of travel taken by the messenger who delivered Peter’s epistles throughout Pontus, Galatia, Cappadocia, Asia and Bithynia. This entry was posted in Bible Places, Bible Study, Church History, New Testament, Photography, Travel, Turkey and tagged Roman Emperor, Roman Empire. Bookmark the permalink.